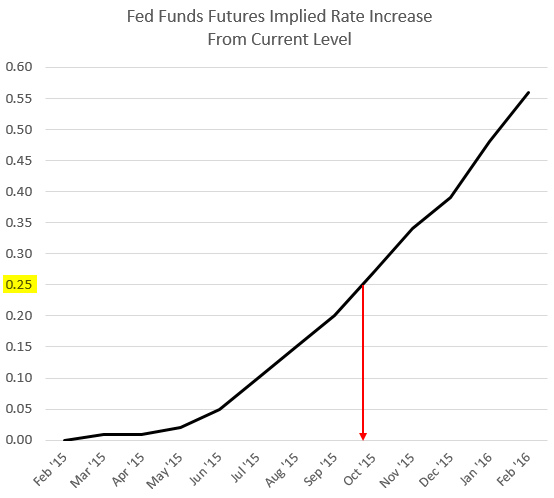 The Fed Funds futures continue to point to the first Fed rate hike in late Q3/early Q4 of 2015. The debate is now focused on whether this timing is unrealistic. To be sure, whether we have a hike in September of 2015 or in January of 2016 will have little direct impact on near-term growth. 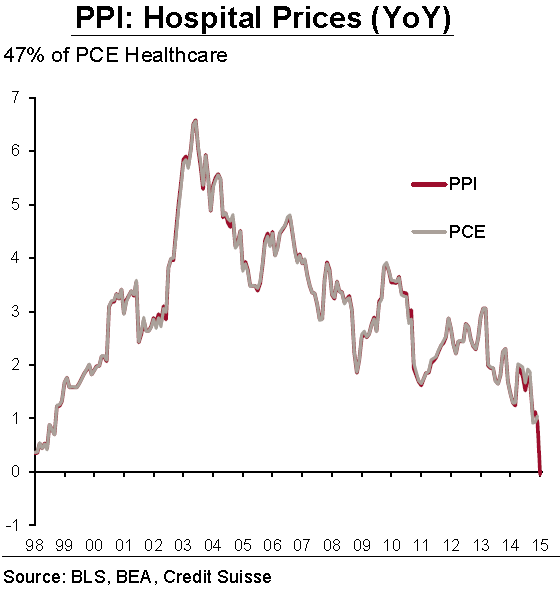 But could an earlier hike exacerbate disinfaltionary pressures in the United States and globally? 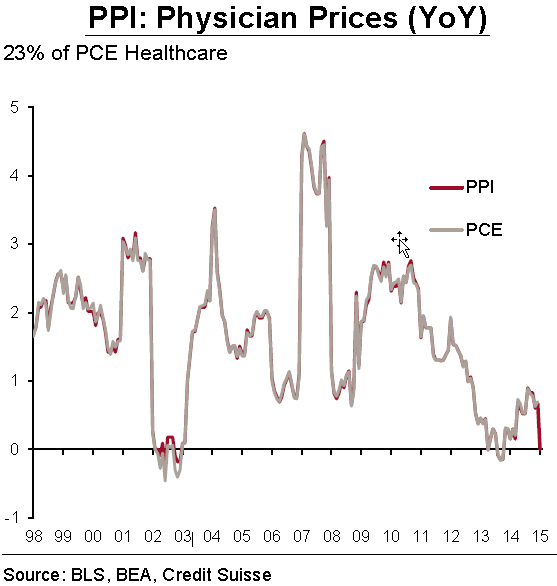 Therefore even if we see some gradual increases in energy prices (which may take some time), inflation measures may remain significantly below the Fed's target for a while. So what could prompt the Fed to act in the next few months? Some argue it will be wage pressures. While we've had a number of forward looking indicators pointing to higher wage growth ahead, we haven't seen that trend in the official figures thus far. Americans are certainly working longer hours, but the pay per hour continues to grow at 2% per year. 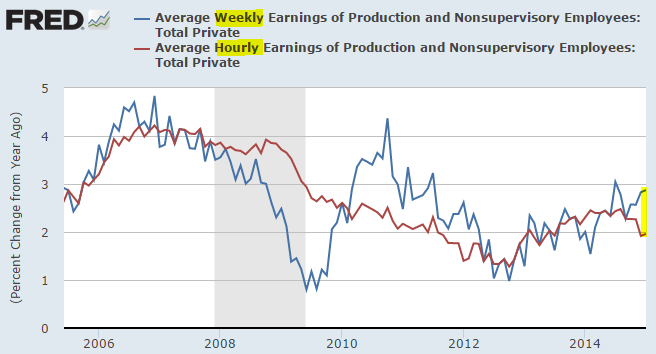 That in no way constitutes wage pressures - at least not yet. 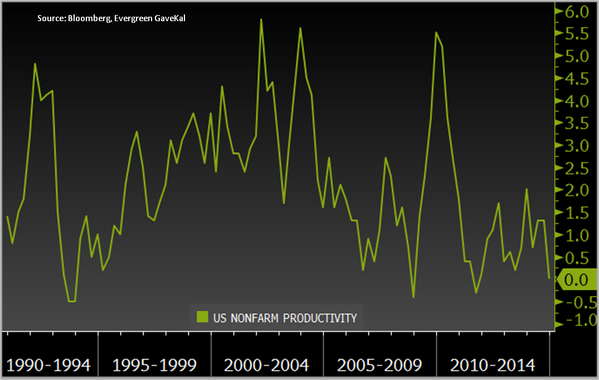 One of the arguments for higher wages going forward is poor productivity growth in the US. Companies will be forced to hire more people and pay them more - the argument goes - in order to compensate for difficulties they are having in achieving growth with their existing workers (via technological and process improvements, etc.). Perhaps. But even if we see a modest improvement in wage growth in the next few months, the FOMC remains concerned about pushing the dollar higher and destabilizing global economic conditions - the equivalent of another "taper tantrum". For example, it's important to keep in mind that the Greece situation is likely to resurface again in 4 months or earlier. The FOMC: - ... the increase in the foreign exchange value of the dollar was expected to be a persistent source of restraint on U.S. net exports, and a few participants pointed to the risk that the dollar could appreciate further. In addition, the slowdown of growth in China was noted as a factor restraining economic expansion in a number of countries, and several continuing risks to the international economic outlook were cited, including global disinflationary pressure, tensions in the Middle East and Ukraine, and financial uncertainty in Greece. 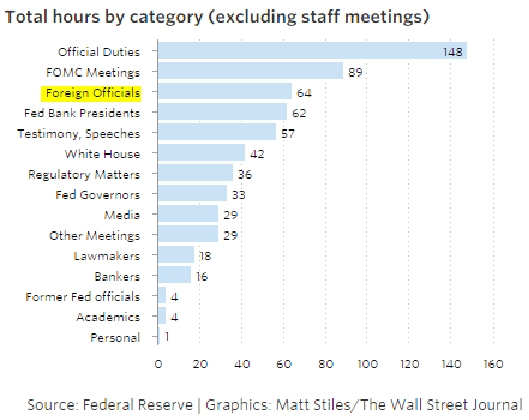 And for those who still believe that the Fed is too domestically focused, just take a look at what occupies a good chunk of Janet Yellen's time these days. At this point we would need to see a major shift in domestic wages and inflation indicators as well as a more stable international economic picture in order for this dovish FOMC to move on rates. The expected rate hike in the next 6-7 months indeed seems unrealistic.